Our purpose is to give all our children access to educational experiences of the highest quality. We encourage all our children to attain the highest standard of personal achievement. Our purpose is to challenge all our children by giving them experiences of the highest quality. Amanuensis: A writer in student’s own words for tests. Annual Review: annual review of an Education, Health, Care Plan (EHCP)of special educational needs which the LA must make within 12 months of making the statement or as the case may be of the previous Review. Asperger’s Syndrome: A mild form of autism which hinders communication and means that the child cannot relate to others even though they are frequently highly intelligent and speak fluently. It is a collection of symptoms not all of which occur in every affected individual. ADD hyperactivity: Attention Deficit Disorder – a condition thought to lead to hyperactivity concentration and other behaviour problems, which may also be linked to ADHD. ADHD: Attention Deficit Hyperactivity Disorder – A condition thought to lead to a range of behavioural problems. Cerebral Palsy: When a child has Cerebral Palsy, it usually means that part of the child’s brain has been damaged. Cerebral Palsy causes some of the messages from the brain to the muscles to become muddled. The brain damage which has caused Cerebral Palsy does not get worse as the child gets older, but the problem he/she has may change, especially as the child grows. There is no cure. Cause for concern (C for C) Teachers will have observed and assessed the progress of individual’s and will be able to provide information where a pupil hasn’t progressed even though the teaching style has been differentiated. The pupil is the highlighted as C for C.
CoP: Code of Practice – guide for schools and LA about the practical help they can give to children with special educational needs. It recommends that schools should identify children’s needs and take action to meet those needs as early as possible, working with parents. It recommends that schools should deal with children’s needs step-by-step, matching the level of help to the needs of the child. Dyscalculia: A Specific Learning Difficulty concerning difficulties relating to numerical calculation. Dysfluency: Stammering and other speech problems. Dyslexia: A Specific Learning Difficulty which leads to particular difficulties with reading, writing and spelling. Pupils with dyslexia may also have problems with personal organization, with self-care skills such as dressing or with their language development. Educational Psychologist (EP): Professional engaged in the scientific study of the mind and reasons for students’ behaviour and learning patterns. Hearing Impairment: When a child has a hearing impairment the degree of hearing difficulty varies according to their particular diagnosis. • Soundfield System – classroom speaker system set at same frequency as child’s aids. Laterality: Awareness of left and right within the body and ability to control two sides of the body separately or simultaneously. ME: Myalgic Encephalo Myelitis. A fluctuation of symptoms from day to day, fatigue after minimal effort, feeling ill, visual disturbance, loss of attention, muscle or joint pain, nausea, headaches, mood changes, altered skin sensitivity, dizziness and altered temperature regulation. Modification: Amendment or alteration of a programme of study; attainment target, assessment or any other component of the National Curriculum in order to give the child access to that area of the Curriculum. Occupational Therapy: Type of therapy to help children who have a physical impairment / disability. At Whitehouse, the occupational therapist works closely with the staff team to provide pupils with access to occupational therapy programmes/specialist equipment to meet their curriculum needs. Optometrist: Examines the eyes and related structure to determine the presence of vision problems, eye disease or other abnormalities and prescribe and adapt lenses or other optical aids. Provision Mapping: is the means of documenting the range of support available to pupils with SEN within the school. It enables schools to cross reference types of provision with financial outputs, including resources and staffing, along with time costs. Psychiatrist: Medically qualified professional concerned with mental illness. a) Form of epilepsy characterised by general motor convulsions and loss of consciousness. b) Momentary dizziness, day dreaming and minor motor seizures. 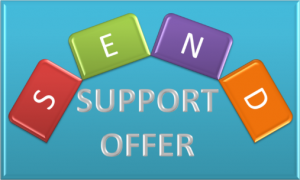 SEN SUPPORT: If the strategies being used are not resulting in the pupil learning it may result in help over and above that which is normally available in class this then becomes SEN Support. External advice may also be sought and can advise staff on new targets, provide more specialist assessments, give advice on the use of new or specialist strategies or materials, and in some cases provide support for particular activities. SEN Tribunal: An independent body established under the 1993 Act for determining appeals by parents against LA decisions on assessments and statements. Their decision will be binding on both parties to the appeal. At Whitehouse, the physiotherapists work closely with the staff team to provide pupils with access to physiotherapy programmes/specialist equipment to meet their curriculum needs. At Whitehouse, the occupational therapist works closely with the staff team to provide pupils with access to occupational therapy programmes/specialist equipment to meet their curriculum needs. Whitehouse is fortunate to have the wonderful resource of a hydrotherapy pool. This facility is used jointly by the physiotherapy department and school. The school employs a Coach (a qualified Life Guard) to supervise hydrotherapy sessions run by the physiotherapist and to run ‘fun’ swimming sessions for some of our children with physical difficulties to supplement their PE entitlement. Children & Young People’s Disability Register Stockton – is a confidential list of information about children and young people with disabilities. The register assists us with service planning and will help Stockton – on – Tees Borough council meet the current and future needs of children and young people with disabilities. Registering will give you the opportunity to contribute to the development of services. We will provide you with information about events, activities in your area that may cater for your child/young persons likes and needs. Register today and you could receive lots of information on fun days and activities in your area, and the first 500 people to register will get a free concessionary MAX card which you can use to get discounts into various venues across the region.